Eastman Chemical has thrived while its former parent company has faded away into bankruptcy. 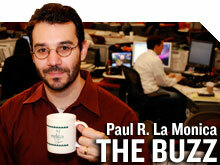 NEW YORK (CNNMoney) -- It is every parents' dream that their children enjoy a better life than they have. I am not sure if that's also true for parent companies and their offspring. Witness the case of Eastman Kodak (EKDKQ). The iconic photography company finally succumbed to the inevitable and filed for bankruptcy earlier this month. The writing had been on the wall for several years. And most people were taking pictures of said wall with the camera on their smartphones. Kodak never truly succeeded in transforming from the film era to the digital age. But the Eastman name still is alive and well with another company: Eastman Chemical (EMN, Fortune 500). That firm was spun-off from Kodak in late 1993. At the time, the already struggling Kodak made the move to help cut debt and focus more on the trademark photo division. "We determined that there was little strategic reason related to our core imaging and health business for Kodak to continue to own Eastman," said then CEO Kay Whtimore at a press conference in 1993. Yet one can't help but now wonder if this move was a mistake. Sure, I know the saying about hindsight and perfect vision. But Eastman Chemical has thrived over the past two decades. Will Kodak be a zombie brand? The stock has more than doubled since it was spun-off. That does lag the broader market during that time frame. 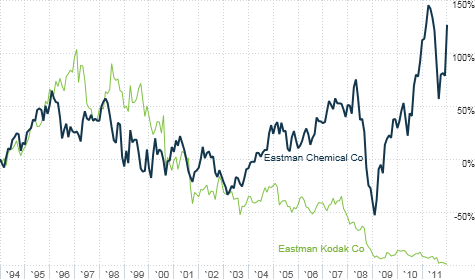 But Eastman Chemical has clearly done far better than Kodak. And the future may be even better. Eastman Chemical surged nearly 6% Friday on the news that it was buying rival chemical company Solutia (SOA) for more than $3 billion. Eastman Chemical said the deal will immediately add to its earnings and increase its exposure to lucrative emerging markets in Asia. Analysts expect the company to report revenue of $7.4 billion this year and a net profit of $652 million. Earnings grew at an average rate of 14% a year annually for the past five years and are expected to increase about 10% a year for the next few years. Eastman Chemical has a relatively low debt-to-capital ratio as well. Would Kodak have been able to stave off bankruptcy if it still had all the solid sales, earnings and cash from the chemical business to help subsidize losses in the imaging unit? Maybe. Maybe not. It's fair to argue that Eastman Chemical may not be in as strong a position as it is today if it remained stuck within the declining Kodak empire. "The photo business at Kodak would have dragged down the chemical part of Eastman," said Randy Bateman, manager of the Huntington Situs Fund (HSUTX) in Columbus, Ohio. Bateman said his firm has owned Eastman Chemical for several years. But it does serve as a cautionary tale to the many companies rushing to break up and spin-off divisions in the name of "unlocking hidden value." Sometimes it may be better to hold on to a good asset instead of letting it go. Eastman Chemical makes for an interesting woulda coulda shoulda scenario. Things might be different today if Kodak didn't get rid of its chemical business. Then again, shareholders of Eastman Chemical aren't complaining. Best of StockTwits and reader comments of the week. Starbucks (SBUX, Fortune 500) had a great quarter. CEO Howard Schutlz is benefiting from that with a handsome $65 miillion pay package. But the stock still fell on guidance. BryanMortenson: After ~3 years the Street finally sets the bar high enough on $SBUX. Great Q by all accounts; solid long-term story. Exactly. Starbucks did actually raise its outlook. But analysts already had boosted their estimates in anticipation of this. That's probably why the stock is pulling back a bit. agwarner: $SBUX blaming commodity costs? They strike me as quickest company in history to adjust retail prices. That may be a bit of an exaggeration. Why I'm on line at Starbucks right now to get a chai latte, and ... what the ... It now costs a nickel more because of a spike in cardamom prices? PattyEdwards: I've always been amused that $SBUX's IR person is JoAnn DeGrande. She's a lovely person... with a most fitting name. That is pretty funny. The only thing better would be if she had a daughter and named her Venti. Then again, corporate loyalty should only go so far. Finally, a follower named Christian Koulichkov just killed it this week. He had numerous tweets that were worthy of RCOTW. I chose two. It does pain me to praise him because his icon is the logo of the Patriots and his handle is @BostonBroker33. But we can be enemies next week. I spent a lot of time this week on Twitter joking about how Research in Motion's (RIMM) new CEO failed to impress investors. I also pointed out how Kleenex maker Kimberly-Clark (KMB, Fortune 500) reported disappointing profits. Christian combined the two into this gem. He even used my "This just fictitiously in" line! "this just fictitiously in: $KMB strikes deal with $RIMM as official hanky for shareholders and frustrated Blackberry owners." And he followed up one of my numerous tweets about the Fed's new interest rate projections with this. "the Fed still uses DOS. Alt shift explode."